Miriam's Well is more than a shop, school or studio. 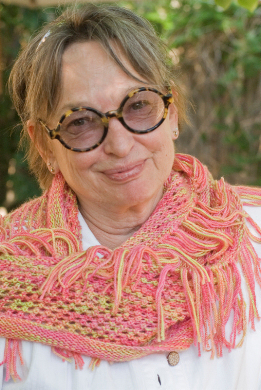 Miriam’s Well – fronting Paseo near Marcy Street – is home to both The Santa Fe School Of Weaving and a small boutique featuring the colorful hand-woven wraps of Miriam Leth-Espensen. A renowned weaver, Miriam arrived here more than 20 years ago from Vermont, when she bought her current downtown home, studio and shop. With both her sons in college at the time, the craftswoman decided to trade in her rural New England life for one in downtown Santa Fe, with a view to retirement and stopping the endless travel to craft shows to sell her wares. A member of the league of New Hampshire Craftsmen for a quarter of a century, Miriam knows weaving like no one else. She began with her boutique, but has also expanded into a weaving and knitting school. “The boutique and school all work together. I teach people design concepts and the technical skills to go out and produce their own things. I sell the materials for them to do so: the looms, and the tools, books and instructions (and of course a wonderful selection of yarns and fibers) and everything you need to pursue the craft and get inspired.” That is what is unique about Miriam’s shop: her success comes from sharing her inspiration with others. Another part of the longevity of Miriam’s Well as a client base that goes back decades. This is supplemented by online sales, tourist traffic and word of mouth among communities of people with a keep interest in handcrafted goods. Ms. Leth-Espensen credits her classic background for much of her skill. It started with childhood in Denmark, where “even a hardware store is a minor art gallery”, followed by a formal education in a Jerusalem School of Art, where she learned from Bauhaus-era teachers. She recalls: “A lot of weaver I’ve seen in this country weave cloth you can poke your finger right through. I had a teacher who would come around, and if she could poke a finger through our weavings, that was the end of that project (her name was Ruth Kaiser). There was no tolerance for that. “Most of the people who buy my things are a little more sophisticated perhaps and have an understanding of design value.” In addition to her European aesthetic, Miriam cites her artistic freedom as a true inspiration. “I don’t do any more custom things. I used to… now I only do exactly what I want to do. If you like it you may buy it, and if you don’t like it, that’s okay. It’s an enormous amount of freedom.